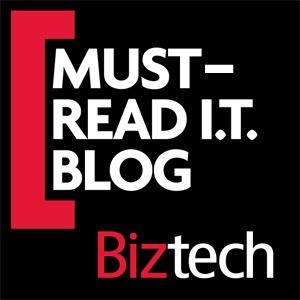 In September I was honoured to discover that BizTech Magazine had recognized The World According To Mitch on their list of 50 Must-Read IT Blogs from BizTech (Sept. 7, 2011). Several weeks ago I was contacted by Ricky Ribeiro, BizTech’s Online Content Manager asking if I would be willing to do an interview about blogging and the IT industry. I was delighted to do so. On Sunday the interview was published. Sometimes it amazes me that I have come so far… I remember when I first started blogging, and who was responsible for it (there are two people). I saw one of them in the cafeteria this past week, and I had drinks with the other in December. When they told me to start (and then told me to publish at my own site rather than the MITPro site) I could not see the value… but I trusted and respected both of them, so I started. I see the value now, and every time an up-and-coming IT Professional asks me for advice on how to get noticed, I have the same advice for them that Rick and John had for me… Build your Brand. As hard as it may be to fathom, I remember starting out wondering who would care about what I had to say. I also remember thinking that a few little articles would not earn me a lot of credibility. I was probably right… but I have now been blogging for seven years, and The World According to Mitch (the third incarnation of a blog that was born in 2005) will celebrate its 300th article this week (if my Editor approves the complete rewrite she assigned me on Thursday). We have had over 100,000 visitors, and a plethora of comments and conversations (many of which, unfortunately, were lost in the numerous moves over the years). I am amazed every time someone refers to my articles as authoritative, and appreciate every single visitor. If I am the luckiest man in the world it is because I have an amazing family, I get to work with amazing technologies, and have an amazing job that affords me the opportunity to speak to and interact with some amazing people. If someone were to ask me what are the qualities that make my blog successful I suppose it is the combination of my vast life experience and travels, combined with a love of life, a passion for technology, and an understanding that talking about high-level subjects does not mean you have to talk over peoples’ heads. If you can’t explain something simply, you don’t know enough about it. I often hear from people who stumble across my blog who say “Wow… I have no idea what you are talking about, but it sounds really interesting.” I do not dumb my articles down, but I do try to explain high-level concepts in clear, concise terms. I have been asked to explain concepts such as Server Virtualization to non-technical audiences before, and I do… however you also have to know who your intended audience is, and speak to their level. My technical articles would be useless if I wrote them for non-technical people. The truth is that most of my articles will be easy to understand by anyone, but without the prerequisite knowledge of the subject matter they would not be able to do anything with them. Occasionally I hear from someone that ‘Wow, I read your article, and I was actually able to understand what you were talking about!” That is because I make things as complicated as they have to be… and no more so. ← Who Pray Tell is Jack Oprah: Missing pieces are easier to contend with than wrong ones. You deserve the spot Mitch. And I’m very glad I found your blog. You still have a lot to share to the world. All the best.